The Blue Book is discontinued due to the restricted funding. We do answer to many phone calls daily from the individuals not having access to the internet or experinceing difficulties navigating the service systems. Our information and referral specialists seem to be responding to the most complex information needs thanks to their long standing work in the community. 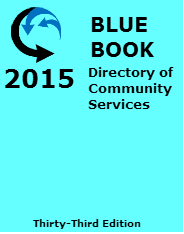 The Blue Book Directory of Community Services in Waterloo Region was the trusted source of community information for more than 40 years. The Blue Book was comprehensive, listing local human services provided by social agencies, community organizations and governments, and features cross-referenced Name and Subject Indexes for quick access to agency information.